Bailey Snyman (Standard Bank Young Artist for Dance in 2012) and Nicola Haskins (Ovation Award winning choreographer) of The Matchbox Theatre Collective celebrate 10 years at the National Lottery Fringe in Grahamstown this year. Matchbox Theatre Collective is presenting three works at this year’s National Lottery Fringe in celebration of their 10 year anniversary. If These Bodies Could Speak (choreographed and performed by Haskins and Snyman) and Giftig (performed by Snyman and Micia de Wet) have just returned from rave reviews at the Prague Fringe Festival in the Czech Republic. 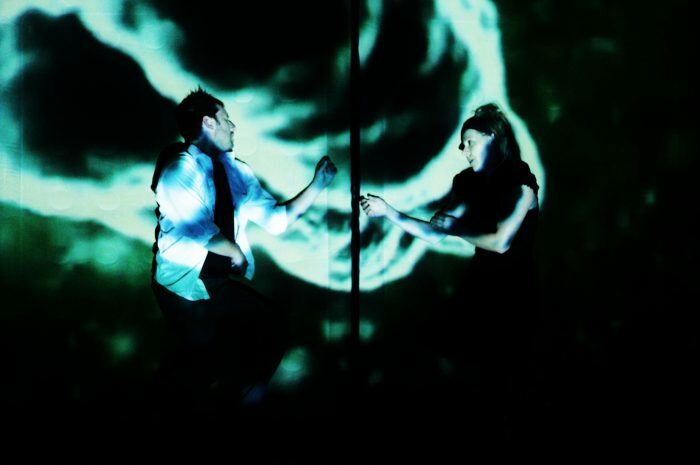 If These Bodies Could Speak is a digital-dance love story that brings together dance, projection, lights and shadow play to explore the complex relationship of a couple that are struggling to reconnect with each other in a world overwhelmed by social media. Giftig (originally conceived by Micia de Wet and Timo Schutte) is an English language physical theatre production that is charged with comedy and emotion. You will laugh and cry, reflect and surrender. A sister waits on the beach for her lover to return from the ocean. A brother waits knowing he will never return. Their parents are lonely together. This two-hander risks the ideals of love, loss and apathy that surrenders to comedy, and touches the heart of the meaning of life. 2 minutes can feel like an eternity. “Mixing dance and acting, past and present, with a sense of flow that is fluid and natural, it knits out the complexities of having to let go… with the understanding that this is a forever goodbye,” said Cue Online of the production. Giftig will show at Glennie Hall on 1 July at 14h00, 2 July at 18h00, 3 July at 21h00, and 4 July at 12h30. Choreographed and Directed by Matchbox Theatre Collective’s Bailey Snyman and performed by Liquid Fusion’s Mark Tatham and Daniel Geddes, BURN chronicles man’s relationship with Mother Earth. BURN is an epic tale told through dance about man’s discovery of the world he inhabits and the consequences of his unprecedented failure to preserve this relationship. BURN walks the tenuous line between past, present and future of our collective history with fire and results in an explosive conclusion that comments on the visible effects of our inability to preserve our precious resources. Fresh from performances in Iceland, Norway and Greece ,BURN exhilarates with relentless choreography as two men navigate the creation myth, the art of war and the desolation of post-apocalyptic destruction. BURN’s original soundtrack composed by Geddes and edited by Snyman is a haunting exploration of fire and an emotional tribute to this planet we call home. Music, bodies and choreography collude in a life that becomes a race with the fire. BURN will be performed at PJs on 5 July at 14:00 and 20:30, 6 July at 16:00, 7 July at 22.30, 8 July at 14:00 and 9July at 18:30. For more information, contact bailey.snyman@gmail.com.